Each week in the Alumni Notebook, we highlight Softball Factory alums who are performing well at all levels of college softball. Alexa Romero – Romero is a sophomore pitcher for the Syracuse Orange and has just been named to the Atlantic Coast Conference’s All-ACC Second Team for her impressive performances in the circle this season for the Cuse. The Aurora, Colo. native owned the top ERA on her team (1.73) and held opposing batters to an ACC second-best average of .141. She led the Orange and ACC in batters struck out (264), tallied 17 wins on the season and threw 14 complete games. The three-time ACC Pitcher of the Week tossed her program’s second-ever perfect game in an 8-0 win over Sacramento State – along with two no-hitters against Virginia Tech and Virginia – and became the first Orange in the history of the program to throw three no-hitters within one season. 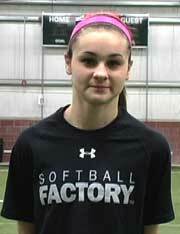 Romero attended the 2013 Softball Factory Christmas Camp & Tournament and an Under Armour Softball Factory National Tryout in Golden, Colo. in June of 2013. Elissa Brown – Brown, a sophomore outfielder for the Alabama Crimson Tide, has earned Second Team All-SEC honors for her hot offensive efforts this season. The Exercise Science major totes the second-highest batting average on the Crimson Tide roster (.345) and has recorded 24 runs, 41 hits, a double, three triples and 13 RBI. Her 26 stolen bases on the year are sixth-most in the Southeastern Conference. The Eclectic, Ala. native took part in an Under Armour Softball Factory National Tryout in Trussvlle, Ala. in June of 2014. Allison Luzzi – Luzzi is a University of Bridgeport sophomore shortstop who has snagged First Team NFCA All-East Region honors for her outstanding performance on the 2018 season. The East Haven, Conn. native led the Purple Knights in home runs, smacking 11 of them this year. She totes a .384 batting average, has scored 45 runs and has registered 61 hits, 14 doubles, four triples and 36 RBI. The Biology major participated an Under Armour Softball Factory College PREP Program in Middletown, Conn. in February of 2013 and the Softball Factory World Series of the same year. Kourtney Coveney – Coveney, a junior third baseman for the West Texas A&M Lady Buffs, has just received Division II Conference Commissioner’s Association (D2CCA) All-South Central Region Second Team honors after thriving both at the plate and on the hot corner for her team this season. While at the plate, the Pre-Med major batted .323 in 2018, drove in 42 runs, drew 27 walks, and smacked 51 hits, four doubles, four triples and eight home runs. While on third, the Katy, Texas native picked up 40 putouts and 89 assists. 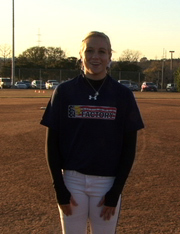 She attended an Under Armour Softball Factory College PREP Program in San Antonio, Texas in January of 2013. Riley Shields – Shields is a sophomore pitcher and first baseman for the Alverina University Golden Wolves and has been named to the All- MAC Commonwealth First Team for her success with both facing batters and taking at-bats. On the mound in 2018, the Lewes, De. native finished the regular season with an impressive ERA of 1.58 and 74 strikeouts recorded. She is no slouch at the plate either, as she is currently batting .355, slugging .462 and has recorded 14 runs, 33 hits, seven doubles, one home run and 12 RBI. The Occupational Therapy major took part in an Under Armour Softball Factory National Tryout in Savannah, Ga. in November of 2014. Ilissa Hamilton – Hamilton, a sophomore pitcher for the Case Western Reserve Spartans, was named the University Athletic Association Pitcher of the Week for the fourth time in her career after helping her team become the victors of the NCAA Division lll Softball Notre Dame Regionals this past weekend. The Spartan went 4-1 in the circle, allowing just three earned runs in a total of 29.0 innings pitched, striking out 23 batters along the way. She threw six shutout innings during her team’s 5-0 win in a contest against Ohio Northern on Sunday. Hamilton also contributed at the plate, going four-for-14 with a double and two RBI. The recipient of the regional’s Most Valuable Player award has pitched 18 wins and 16 complete games on the season, while holding the top spot on her team and in the UAA for most strikeouts registered (169). The South Abington Township, Pa. native attended an Under Armour Softball Factory College PREP Program in Sellersville, Pa. in September of 2012. This entry was posted in News and tagged Alabama Crimson Tide, Alexa Romero, Allison Luzzi, Alverina Unviersity Golden Wolves, Case Western Reserve Spartans, Elissa Brown, Illisa Hamilton, Kourtney Coveney, Riley Shields, Softball Factory, Softball Factory alumni, Softball Factory Alumni Notebook, Syracuse Orange, University of Bridgeport Purple Knights, West Texas A&M Lady Buffs on May 18, 2018 by Jessie Schaffer.